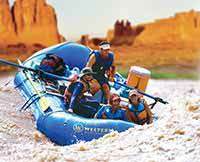 Very Well Organized Utah Rafting Trip With Good Food and Wonderful Guides! 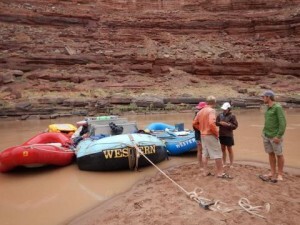 This is my second trip with Western River Expeditions; the other one was 7 days in the Grand Canyon. Both trips are great and similar in some ways. 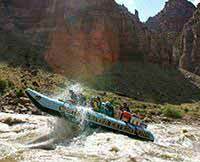 This Cataract Canyon trip was half as long, and the first day is just floating before reaching the first rapids. The Colorado River is warm enough to swim (at least it was in September), unlike the Grand Canyon trip. The provided tents/sleeping bags/cots were very comfortable, and I slept out under the stars most nights, only retreating to the tent when it rained one night. The guides prepare all the food. You need to bring your own liquid refreshment to supplement the water and lemonade provided.The guides are very friendly and helpful. I always felt very safe. We were able to paddle small rafts through all the rapids (unlike in the Grand Canyon). A definite highlight on this trip were the other guests. The four kids were well-behaved and very nice - also entertaining! If you worry about not having a flush toilet and/or a nice daily shower you might not like this trip, but everyone on our trip was fine with that. The company flew us back to Moab over the river we had traveled down in several small planes. That was a special treat!